There probably isn’t going to be as extensive a discussion of history today, just because I think everyone knows what a Mox is by now. They’re essentially synonymous with Magic itself, as the game’s own take on the fantasy trope of magic jewels – not to mention one of its longest-lived consistent mechanical designs. I know that the reason it’s been a number of years since the last Mox can’t be because they’re running out of gems and/or minerals to use for the names: there are so many they haven’t used yet! Like Mox Opal, the Amber’s dependency on what other permanents you have in play puts a natural limit on how degenerate one can get with it. But I think this card will easily be underestimated. On the third or more turn, when a deck incorporating one or more legends is likely to have some in play, it does a good impression of what the originals do in Vintage, with the downside that your opponent will have had the same amount of time to develop their side of the table. And that’s even before we take into account that Commander decks always, by the format’s design, have a legendary creature in their hand. Besides, triggering the kind of card that looks for casting of historic cards, for the cost of exactly zero mana could well turn out to be priceless. The word “Mox” carries a lot of weight in Magic. The original five live on in infamy as parts of the Power 9 while the others, while toned down, are still very powerful. 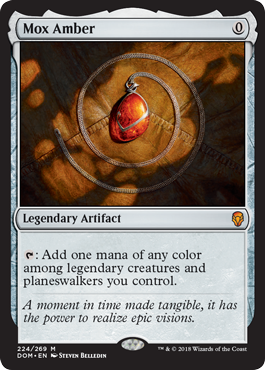 I feel like amber is an appropriate jem as it captures something from the past.Mox Amber continues the tradition as a 0 drop mana accelerator. The unfortunate thing is that Amber is de facto slower than its brethren. With being said, it is unfair to compare any card to the original Moxen. I’m starting to sound like a broken record but this card is great in Commander. I feel like this card should be in any Gishath commander deck for flavor alone. Its like a second Command Tower. This is free mana. Its free. It wouldn’t be Dominaria without moxen, right? And lotuses, but that’s covered in another card. But here’s the first new Mox since Scars of Mirrodin, Mox Amber. All hail zero mana artifacts that make more mana. Well…not without a hitch. Mox Amber is limited to making mana based on the colors of legendary creatures and planeswalkers you control; remember that mana abilities can’t be responded to, so you can’t have your creature Doom Bladed to stop mana production, but this is the rare Mox that doesn’t want to come out on turn 1, no strings attached. There are only a couple of one-drop legendary creatures (Isamaru, Hound of Konda, Kytheon Iora, and Rhys, the Redeemed come to mind), and planeswalkers don’t start coming out before two mana (more often three mana). So this is more a mid-game mana rock than your usual “do degenerate things early” Mox. With all that said, Mox Amber is still a zero-mana mana rock, and you still can chain together multiple Moxen to make a massive play in one turn. It’s probably on the lower end of the power scale for Moxen, but a weak Mox is still plenty powerful all the same.